Today, we’re taking homemade polenta to a whole new level… (way beyond skipping the stuff that’s sold in the tube). I ground up my own polenta from popcorn! Who knew it was as easy as that? This recipe comes from The Homemade Flour Cookbook, by Erin of Naturally Ella. Erin is one of by best blog friends (BBF’s forever! ), and I couldn’t be more proud of her and her beautiful new book. She breaks down the basics of making your own flour out of all sorts of grains, seeds, nuts, and legumes. It’s also packed with recipes for each type of flour. (Side note: if you don’t feel inclined to grind your own flour – you’ll still love her book for all of the wholesome recipes). I can’t wait to try her quesadillas made with Quinoa Tortillas, Buckwheat Enchiladas, and Blueberry Amaranth Muffins. I tried milling this two ways – I used my little cheapie coffee grinder the first time, and my Vitamix the second. (See my notes at the bottom of the post for more details). This home-ground polenta was creamier and tastier than the kind I usually buy at the store. Plus, it only took a few minutes to grind up and then it cooked faster than usual. (Less than 10 minutes on the stovetop). I took the idea of Erin’s roasted zucchini salsa but made a raw version instead. I diced up the zucchini pretty small, tossed it with tomatoes (and other things), and let it marinate for a few hours so the juices could infuse into zucchini and take away it’s raw bite. (think: zucchini ceviche). At the end, I stirred in some diced avocado and topped it onto my grilled polenta. A perfect light meal for summer! THE GIVEAWAY: And, of course, we’re giving 1 copy away. To enter, just leave a comment below. (Open to US residents. A winner will be chosen at random on Thursday). Grind the popcorn in a coffee grinder or high speed blender (such as a vitamix). Sift to remove the hard pieces from the soft flour (don’t skip this step or you’ll have crunchy polenta). Make the polenta: In a medium saucepan, bring the corn flour, water, garlic powder, and salt to a boil. Cook, stirring frequently, until mixture thickens to a creamy consistency, 3 to 4 minutes. Spoon the mixture into an oiled 8x8 inch pan. Let the polenta cool completely. (I made mine a few hours in advance and let it chill in the fridge to set). When ready to grill the polenta, slice in to 2-inch squares and brush each side with olive oil. Place on a preheated grill (I suggest using a grill pan since these are delicate). Cook each side until browned, 4-6 (or more) minutes depending on the heat of your grill. (or in my case: pan). (optional - I served mine on top of a few handfuls of arugula). (alternative option) Erin’s Roasted Zucchini Salsa Recipe: Toss 1 cubed zucchini, ½ diced onion, ¼ of a red pepper (diced), and 1 tablespoon minced serrano with1 tablespoon olive oil and salt. Roast in a 400 degree oven for about 30 minutes until the zucchini begins to char. 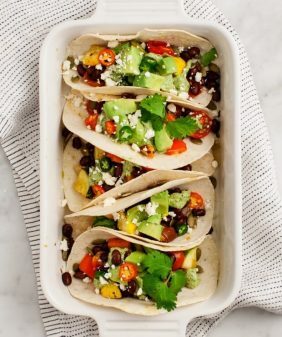 Remove and toss with 1 tablespoon lime juice and 2 tablespoons chopped fresh cilantro. I used this cheap coffee grinder for small batches. It did a pretty job – the flour was soft and fluffy – although I sifted out a good amount of harder kernel pieces that wouldn’t grind. (Although, popcorn is cheap and so was the coffee grinder). I think this is great for the occasional use, although I could tell the motor was getting warm (I paused every few seconds to let it cool) so I’m not sure how long it would last with this kind of use. The vitamix blended the popcorn more thoroughly with less waste. (Although if you’re going to be blending flours regularly, Erin suggests getting a separate blender container for flours because these hard grains will dull the blade quicker). This looks awesome! Can’t wait to check out the rest of the book! This looks crazy delicious, but the thought of the sound grinding the corn must have made is making me cringe! I’m sure it’s not as bad as I’m imagining. This recipe looks so good! Thanks for sharing a preview of what seems to be an awesome book. Looks great! Can’t wait to check out the rest of the book. I had no idea it was so easy to grind your own polenta–amazing! Looks like a great summer recipe. I am very interested in what the other recipes offer! I can’t wait to make my own polenta! thanks for the post! not only is the polenta great, but i love the raw rendition of the salsa! can’t wait to try this one out. i just learned that my coffee grinder could make flour, and i was wondering if i could grind popcorn, but was too nervous to try. thanks for letting me know i can! This looks delicious. Although I agree that grinding popcorn sounds a little insane, so I’m glad to have your example to follow! I didn’t know that it was possible to make your own polenta from popcorn- this is so awesome! Thanks for posting! This is genius! I am a popcorn fiend and never thought homemade polenta was simple as this! I love your blog! I learn something new every time I visit. I can’t wait to try this! Thank you!! Love this post! I’ve hardly even cooked polenta, let alone made my own. 🙂 So fun to see one of my favorite blogger’s spins on another favorite blogger’s recipe! Erin’s book is awesome. This is a great recipe for salsa, I always wanted to try different salsa to spice things up. Will definitely try this for sure! What a great recipe! I’ll definitely have to buy Erin’s cookbook. I adore her website and know her cookbook will be just as wonderful as her site. Beautiful photos! I can’t believe I never realized how polenta is made! Super excited to try this. The roasted version sounds amazing! I love polenta, and the tomato salsa looks yummy. I won’t grind the corn but will try the recipe. Thanks. I’m actually eating zucchini right now! This zucchini salsa (and the entire recipe) looks delicious! I never realized I could make polenta from popcorn! What a great idea! It’s totally blowing my mind that you can make polenta from popcorn. Definitely doing this! What a gorgeous cookbook! Love that you chose to tackle the from scratch polenta. So ambitious of you. Totally in love with the ideas behind this recipe! The book sounds fantastic. So…if I just happened to have a stash of red (or blue…or pink…) popcorn, I could hypothetically make multi-colored polenta? Is that what this means? Must purchase your cheap-o coffee grinder and find out! I’m madly in love with raw zucchinis and paired with this genius polenta recipe! Wow…. Can’t wait to try it! My husband loves polenta but I am always hard pressed to find one that does not have dairy. This is perfect. This looks great! I love polenta but have never tried grilling it before. I have the same question. I’d like to try using the organic red popcorn in my pantry! Why didn’t I think of making polenta before?!? I am loving this idea! It is so simple, and looks so beautiful. You and Erin make me drool daily on Instagram:) You both inspire me to cook local, fresh, and delicious food! Looks delicious – I am intrigued that I could do this. PS I love your pics and recipes – always inspiring! This recipe adaptation is beautiful! I love milling my own grains and just made Erin’s barley flour chocolate chip cookies. 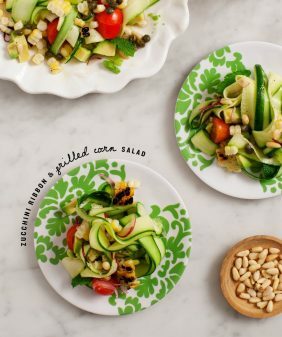 Looks delish-always looking for good zucchini recipes! The book looks wonderful. I am definitely going to buy it. I just purchased the grain blade/container for my Vitamix and so far the only thing I’ve used it for was to make flax meal. Can’t wait to make some other flours with it. Love the idea of grinding your own flours- so excited to,check out the cookbook- she is clever with combinations of wheat free flours. Thanks for a beautiful post, as always. You keep me inspired in the kitchen! Homemade flour… A whole new level of cooking from scratch ! I like this. I am very excited about trying this recipe !!! I just started making my own bread and would love to learn more from the cookbook! Wow, I never knew you could make polenta from grinding popcorn kernels! This recipe is totally up my alley! That is wicked clever! I can’t wait to try this way. Yum! I know that popcorn is made from corn, and polenta is made from corn; I just never figured that popcorn could be made into polenta (or vice versa)! Polenta is such a great and versatile grain, too- a nice change from quinoa or couscous bowls. This recipe is so clever, yet simple. I can’t wait to get my hands on Erin’s book, which I’m sure is packed with other genius ideas. Lovely! I love the idea of making flours, when I found out you could make almond meal from making almond milk and dry it out for use, my baking totally changed! I love polenta and had no idea you could make it just from popcorn!! I’m going to make this and top it with some grilled shrimp, cheers! This looks awesome! I love raw zucchini and I can’t wait to try it in this salsa. I had no idea polenta was ground popcorn kernels. Nice! I found you on Pinterest this AM. I’m very excited to try new healthy ideas especially for my health. Thanks this looks like all must haves. Polenta from popcorn! That’s genius!! Can’t wait to try it. Yes, please! 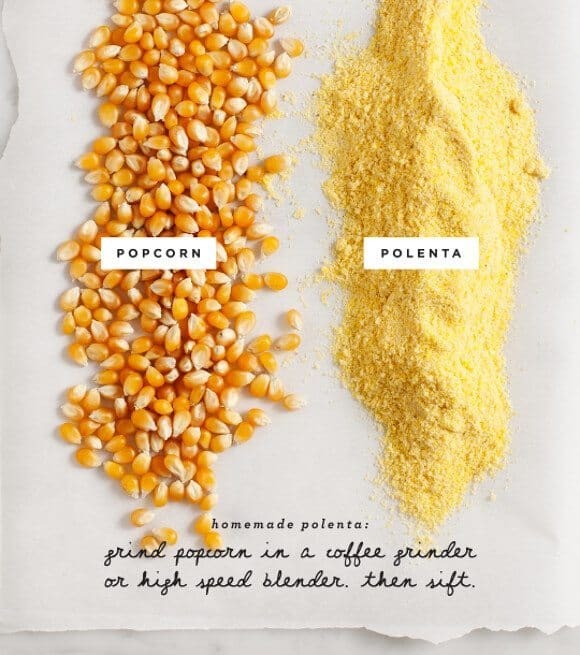 I always want todo polenta but can’t rationalize having cornmeal, corn flour, and polenta–popcorn is a great idea! 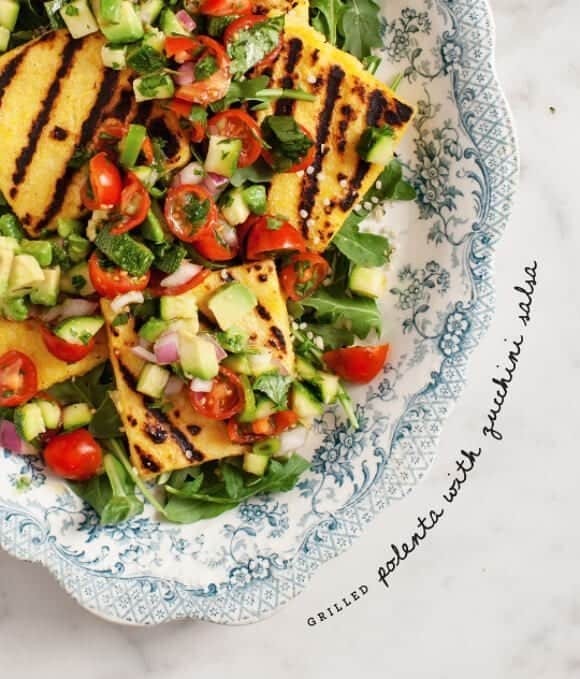 Yum, I love polenta, but I have not tried grilling it yet! Thanks for sharing this recipe. I love the fact that the raw zucchini salad brings something that is traditionally eaten during the winter (at least in Italy) and makes a totally viable summer dish. Lovely! The recipe book looks gorgeous too! there must be a trick in making the popcorn into polenta. i gave it my best shot, ground popcorn in my vitamix. followed exactly and after stirring 30 minutes it was just still a watery soup, nothing at all began to firm. never had seen anything like it. so, how do you get it firm like normal polenta? very frustrating because like everyone else on this blog , i was super excited to make it as well. oh no – I’m so sorry you had trouble. Hmm… did you try setting it in the fridge anyway? Mine (after stirring it), firmed up a bit but it wasn’t super thick and creamy (like other polenta I’ve made) – I poured it into the glass container and let it chill in the fridge and it set. Absolutely beautiful! I had no idea polenta was that easy to make, too — need to try it! That looks SO good. I might have to try making it for dinner tonight! Thanks. I never thought about grinding popcorn for polenta. Neat idea! Good timing! I made a bunch of polenta the other night and have a ton of leftovers. This looks incredible! I have never tried milling my own polenta, but now I can’t wait! Thanks for the idea. And here I always thought that polenta wasn’t from the whole kernel. I’ve run out of corn meal a time or two, but always have popcorn on hand. I’ve ground oats and rice before – looks like this would be a good book for me! Popcorn polenta is just the neatest idea ever! Did you have a grain attachment for your vitamix? this looks great. perfect for summer. Can’t wait to try this zucchini salsa. Sounds delightful! popcorn = polenta. mind blown. i feel like this cookbook will contain a lot of those moments!! can’t wait to try this recipe! yum!! Pretty timely! I just ate polenta and greens (beet and kale) with carmelized onions (reheated from last night in a hot skillet) for lunch! It is a little early here in the South for some of the fresh vegetables (home grown at least) I am seeing on the food blogs I cruise, but I do happen to have a jar of Zucchini relish to go with the polenta! This looks great! Love the idea of making homemade polenta. Thank you for sharing! The idea of grinding popcorn into flour sounds like just the sort of madness my friends always suspect me of… I’ll have to try it! This recipe looks delicious and simple enough for me to do! I knew polenta was corn, but I didn’t realize that you could grind your own kernels to make it! Such a great trick, I can’t wait to make this! I’ve read a lot lately about how the taste of freshly ground flour is so much better than store bought. I’ve also read that if you really want to grind your own, to buy an electric grinder because manual ones take forever. I’d love to give it a try some time just to see if I could tell the difference in taste. Thanks much. I will check out the link. This looks like a great no-meat meal. And I just planted zucchini in our garden. Will definitely give it a try. Thanks for the wonderful recipe and photos. since I am a baker, the idea of grinding my own flour is daunting, so much grinding! but this polenta…this looks amazing, how far to grind it…does it make a difference in the end result, if you use a courser or finer grind? I would think so, just like coffee. I would love to put this book to the test. Hi Kelli, mine ground pretty fine pretty easily – just be sure to sift it before you use it because the hard pieces are harder than “course,” and wouldn’t be pleasant to eat. This is perfect. I didn’t know what I was going to make for dinner tonight. Now I’m inspired to make polenta. Thanks! 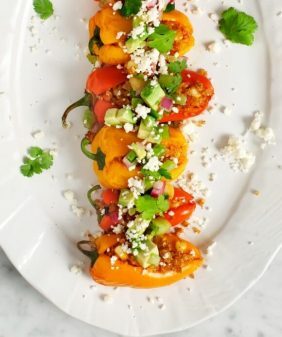 This looks delicious – I’m always looking for great, gluten-free recipes to try out. Yum! 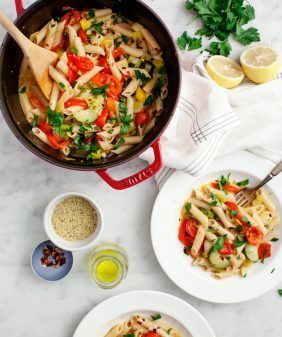 I am new to your blog and loving all the recipes! Thank you for all the inspiration! Talk about getting back to basics. grinding your own there flours, pretty cool. I”m ready. I will have to try both of these. Love your blog. This was a very useful article. I had not thought about grinding my own flour, but this has definitely inspired me. Great recipe! What an exciting exploration! I had never considered making my own flour. Thank you for the idea! I am huge fan of polenta and had no idea you could make it from ground popcorn – how cool! The photos in this book look ah-mazing too! I have been looking to expand my cookbook collection, as I am growing tired of all the recipes in my current arsenal! So awesomely cool that you can make your own polenta out of the popcorn too — it seems so logical after knowing, but I would’ve never guessed that on my own. I make oat flour pretty regularly with my vitamix, but would loveee that book to get tips on other varieties! 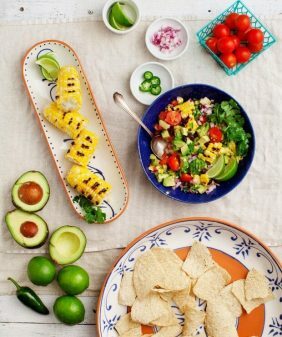 Beautiful recipe and pictures! I like the idea of grinding flours at home…One ingredient used in different ways….I’ve tried oats flour, but never polenta….this does make me want to try it out! whoa, i had never thought of grinding up corn and using it to make polenta. i can’t wait to try this! Now this is a polenta recipe I can’t wait to try! So simple and it looks so delicious! I love this popcorn polenta idea!!!!! I need to fire up my blender now! This salsa looks sooooooo droooool-worthy!!!!! All I want to do is eat a BIG spoonful of it! This looks so delightfully refreshing and yummy! I had never thought about making polenta from scratch before, but it doesn’t sound too hard. Thanks for the continued inspiration! What a wonderful idea. Never thought of making my own corn meal. I will definitely try this now. Thank you for the beautiful post and book recommendation. This is GENIUS! My brother is an a id bread baker so that’s what sparks my interest in flours. He uses fresh everything! From ground flour to homegrown herbs to his own sourdough starter. It’s awesome! This recipe looks perfect for summer! My husband never thinks that an all veggie recipe (i.e. meatless) is filling enough for dinner. This one could definitely work though! Thanks! I love the idea of homemade flour! Would love to try all the recipes in this book. I love, love, LOVE the idea of making my own polenta in the Vitamix. This looks like a wonderful recipe for these hot summer days. Thanks for the great blog and inspiring recipes. My wife loves polenta and we just got some cherry tomatoes from our friend’s garden, so I know what to cook for dinner tomorrow night. Thanks! Looks delicious! That salsa looks insanely yummy!! Mmmm, polenta! So delicious. This sounds absolutely amazing. I love making other flours at home but have never thought to make polenta! This recipe looks delicious and I’m looking forward to owning this book! Beautiful photos, as usual! I was just looking for a summery polenta recipe, can’t wait it try! I love polenta but have only ever bought it already made from the local store – excited to make at home from scratch! Love all your tips and notes – very helpful for us newbie cooks!! 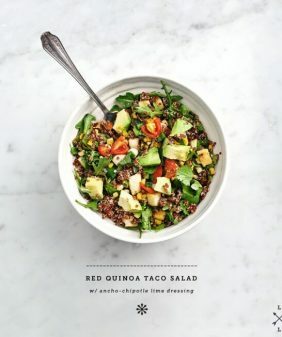 I just saw this cookbook featured on thekitchn and wow! I am absolutely fascinated! The idea of grinding popcorn into polenta is just amazing! This recipe looks so yummy. This cookbook would be an excellent addition to my ever growing collection. Do you think this might be possible to make in a regular frying pan? Hi Verena – yes, definitely. I would probably use a nonstick pan if you have one – they’re a little delicate.